I am lucky to enjoy regular correspondence with York’s puppy raiser, a dynamic and intelligent woman named Melissa. A few weeks ago, she sent me an essay she wrote about the emotions of Puppy Raiser Day – the day when a student meets the family who raised their dog for a year. With Melissa’s permission, I am sharing her piece here. Guide Dog Puppy Raisers are given a fantastic opportunity, one not readily available to the average Joe. For a short time we are allowed to possess an elite dog. A dog of extraordinary intelligence and unparalleled breeding. Dogs with “guide” level acumen are special and I was blessed to have the companionship of just such a dog for eleven amazing months. A puppy raiser picks up a nine or ten week old puppy from the kennel and returns a one year old dog for guide training. In between you feed, you housebreak, you practice obedience, you attend meetings, you expose the pup to all kinds of environments…sounds…people, you try not to fall in love and fail miserably. You fail because it is impossible to raise such a dog correctly and not love, if you can raise without love you’re doing it wrong. Being a puppy raiser is a yo-yo thing. You want so much for your pup to be successful but at the same time it is so hard to think of giving him up. Only a percentage of the dogs bred for guide work actually make it as working guides. The best of the best, the elite puppy corps. When the news comes that your puppy has matched, and you know he will be a guide, there is a moment of incomprehension. The puppy that ran “zoomies” around my house is trustworthy enough to guide someone? My goofy puppy is to be depended upon for someone’s safety? There is an arc to puppy raising. You start with a goofy pup and just about the time you think, “I could live with this dog”, you’re asked to bring them back for training. The dog you bring back is not the puppy you picked up so you know in your heart the dog you raised is ready. Puppy Raiser Day is a yo-yo day. You’re so happy your former pup is one of the elite few. You did it! Everything you worked for has come to pass. You’ve accomplished what you originally set out to do which was to give someone a gift they couldn’t give themselves. You want so much to be selfless and useful and kind. The cost of the gift you give is the loss of the companionship of a being with which you have spent nearly every moment for almost a year. It leaves a void. It is hard to be a puppy raiser, it’s not for cowards. Some raisers believe it is wise to get another pup the same day their old one goes in for training. That works for many people but for me there was the fear I’d look at the new pup and think, “Who are you and where is my dog?” I couldn’t do that to an innocent pup. It seemed to me reasonable to allow myself time to grieve and accept the loss of this close companionship. Reasonable, acceptable, sensible. My sorrow made my gift more meaningful to me. A gift that comes at no cost has no value. But in the end I was given more than I gave. Upon reflection it is hard to conceive of an entirely selfless act, that would be a rare thing I think. The person who is matched with a raiser’s former pup is called a “student” for the duration of their time in training with their new dog. 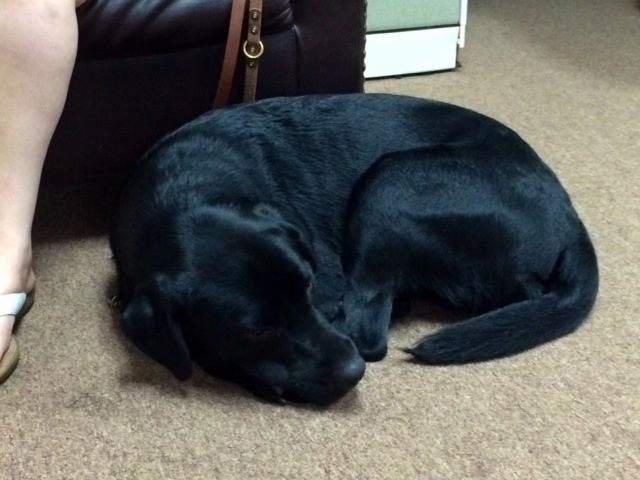 For four weeks the student and dog reside together at the Southeastern Guide Dog campus living and working as a team. If we are to be truthful then we must admit that students are given a dog who is still in no small part puppy. A dog who will require patience and diligent attention to training methods for some time before they reach maturity. While this dog comes to the student at no monetary cost there is still a price to pay. This price is paid in constancy, in patience, in commitment, and in love. Puppy Raiser Day is the day a class of students and their dogs’ raisers meet for the first time. It falls at the end of the on-campus training of the new guide dog team. On Puppy Raiser Day students are asked to walk a short route with their new guide dog for the puppy raiser before everyone meets. Puppy raisers are asked to wait quietly a short distance away so as not to distract their former puppy. It is an anxious time for student, puppy and raiser. My former puppy, York, lifts his nose into the air, sniffs, pauses and makes direct eye contact with me as he arrives at the first curb of his route with his new forever person. He is, as always, too clever and observant for his own good. With every fiber of my being I will York not to break, not to run to me. With everything in my heart I silently ask him to stay with his forever person. You see, I had taken my job as a raiser very seriously. York went almost everywhere with me consequently anytime it became necessary for me to leave him home, either in his crate or with my husband, York was very unhappy. He simply couldn’t conceive of any reason he should be separated from me. At the end of these short partings York’s joy at our reunion was unbounded. No one, nothing would have kept him from me in these moments. I will treasure forever the zoom lens photo I have of that exact moment York made eye contact with me on Puppy Raiser Day. He saw me, he knew me but he stayed with his new forever person…guiding. I was so proud, my bright boy did his job. Clever boy, good boy. Melissa’s zoom lens photo: York looks straight at the camera as he helps Emily negotiate a turn. After the route, polite introduction is made, small talk and the shaking of hands. York thrums with energy, trying with all his being to get my attention. I am delighted with my initial impression of York’s forever person Emily. We were read a short biography before the route. Emily’s bio makes it evident that she is smart and energetic and funny but she is obviously also captivated by York. I like her already. It is custom and courtesy to wait to be invited to visit with your old pup so I politely ask, “May I pet your dog?”, while York spins circles around me. Emily’s answering smile lights the day. She assents and removes York’s leather guide harness. Guide dogs are not to visit or play in harness, the wearing of it is meant to represent serious work time in their mind. York is a wiggling, happy mess. I leave my thoughtful husband to carry the brunt of the conversation with Emily because I’m having trouble taking my eyes away from York. I am riveted by the story York is telling with his ears, his tail, his eyes, the entire movement of his body. I still hear the puppy heart that always spoke to me, it beats a language I understand. While turned York says to Emily with his doggy tongue smile, “Look! Look! My old people are here!” We are old to York not in years for dogs do not see their people that way. Dogs do not see age or infirmity or disability or race, they see us only through the eyes of love. We are York’s old people. Old and dear and loved like a cherished childhood teddy bear now outgrown. With a touch of his nose York tells me he has missed me, but he turns quickly to check on Emily. He lets me know how wonderful he thinks she is. York continues his back and forth dialogue with me for several minutes. So happy to see me, so thrilled with Emily. Finally he slows a little and I undertake to join in on the conversation between Emily and my husband, worried that I might seem impolite by not participating more fully in exchange. When York notices that I am occupied he lowers himself to the ground next to Emily. He closes his eyes and sighs, his chin hugging Emily’s feet. He tells me how much he loves her. I must remind myself he’s a dog, he’s a dog, he’s a dog, he doesn’t really speak to me, but my heart knows otherwise. Puppy Raiser Day includes a delicious brunch. York sits quietly under the table on Emily’s feet during brunch but he presses the flat of his nose against me. The more I get to know Emily the more I feel York has hit the puppy lottery. Emily is wonderful and kind and funny, a talented writer, a gifted vocalist. She leads a very active life, which is just perfect for the energy-filled York. They are, in so many ways, a great match. The brunch, the day, pass quickly and in a blur. When we’re making our goodbyes I give Emily a hug. I whisper in her ear, “Give him a job, he needs to work.” I hope she understands that work is something I can no longer give him now that his puppyhood is past. Real meaningful work, something York with all his breeding, truly needs, something Emily can give him, the special thing they would share. I cup York gently around the ears, kiss his nose and tell him to be a good boy, a good boy for Emily. York walks away with Emily without hesitation, head and tail up, wearing that happy, goofy, tongue hanging dog grin I recognize so completely and then they are gone. In that moment I know I’ve played my part well. York is the best of the best, a member of an elite puppy corps. I was lucky to have him even for a short while. I will never forget him or be incognizant of the rare opportunity I was given to know such a great dog. I will be always thankful for the joy we shared for eleven wonderful months. I’ve come to think of guide dog puppy raising in a very specific way. Being a puppy raiser is a bit like opening someone else’s gift. Some generous soul has allowed that you should borrow their astonishing new gift and play with it before they even get to see it. Thank you, Emily, for lending me your puppy. IT. WAS. AWESOME. 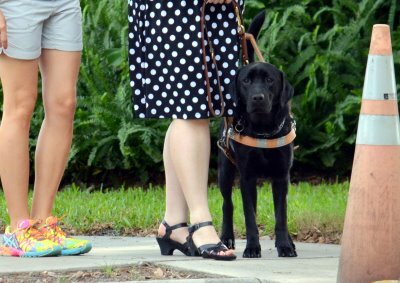 On my first day as a student at Southeastern Guide Dogs, my trainer hands me a new leather leash: “Your invisible dog is attached to the end of this leash. Keep it with you whenever you leave the room.” She shows me how to drape the leash across my body so it won’t get in the way as I unpack my suitcases. It’s Monday afternoon, and I won’t meet my pup until tomorrow. I attempt to handle the waiting by meeting my classmates, learning my way around the building, eating some fabulous food, and getting used to the constant presence of my invisible dog. Tuesday, I’m up at 6AM, steeling myself; the next four weeks will demand this early morning routine. I change clothes, put up my hair, apply sunscreen and bug spray, and head to the dining room for breakfast and a big coffee. We won’t find out our dog’s name, gender, and breed until after lunch. I would be obsessively checking my watch, but I forgot it at home. My seven classmates and I pass the morning with various activities: walks with trainers, walks with dogs in training, lectures. Every time an employee strolls past the common area with a puppy, I tense up – willing to fall in love. I feel like a starving person gazing through the window of a famous bakery, my view of the croissants blocked by a forbidding sign: CLOSED UNTIL 2PM. York, York, I try the name in my mind. It sounds promising. Kind of literary and not obnoxious. I was afraid I’d have a Princess or a Snuffles. I can handle York. Once each student has been told about their dog, we go to our own rooms. The trainers tell us to turn on all the lights, since animals aren’t crazy about shadows. Sit in your desk chair facing the door. When your dog is brought in, call it and clip your leash onto its collar. I walk down the hall and easily find my room – Room 3, last on the right. I flip on all the lights, even taking off my sunglasses. I want York to see my face unobscured. I take my position in the desk chair and wait, checking the time on my phone. 1:15. Deep breath. 1:22. Hands folded in lap, unclenching fingers. Another deep breath. 1.34. I can’t stand the silence – I send a text to Mom. I feel like I have a version of wedding jitters. Puppy jitters? I keep my breathing slow. I hear a commotion in the hallway, a door opening and high-pitched voices. A few doors down, a classmate is meeting his dog. Everyone sounds happy, a trainer says, “Oh she’s wagging her tail, call her.” A joyful meeting. I’m on pins and needles. Now I hear more introductions – opening doors, jingling dog collars. The sounds are coming closer. Finally, I hear the student across the hall meet his girl, and the neighbor on my left meets his. I know I’m next. He approaches hesitantly. The dark shape at the doorway resolves into a shiny black dog, much bigger than my 20-pound cairn terrier at home. With long legs and an inquisitive nose, he comes towards me. The handler holds him still so I can clip my leash to his collar and attempt to pet him. She leaves us alone for the anticipated moment: bonding time. Whatever I imagined this moment would be, it defies my dreams. York wants nothing to do with me. He quickly runs to the end of his leash and whines, sniffing towards the door, where the familiar handler has left the room. After several minutes of pacing and sniffing, resisting my cheerful calls, he finally sinks to the floor, head and tail down – the picture of misery and disinterest. My heart is broken and my thoughts are racing. He doesn’t like me. He doesn’t want to come near me. How can I get him to love me? I don’t push. I don’t intrude. If York wanders near me, I reach out a hand to touch him, to let him sniff me. He sniffs but does not lick. Pushing my hands away with his nose, he won’t let me pet him. But his apathy won’t alter our schedule. A few minutes later, trainers come by to lead us outside to the relief area where the dogs can get water and “busy busy” (do their business). York drinks water but doesn’t busy. Then it’s into the Day Room for a lecture. The trainers have told us that we should concentrate on bonding with our dogs: give them lots of love and attention but try not to correct them as much in these early hours. During the lecture, York rolls on the floor and whines, trying to get other dogs to play. At least he seems happy – however embarrassed I might be. Clearly he’s a class clown, and he manages to get other dogs riled up. Our side of the room quickly earns a reputation for rowdy boys. Back in my room, I try one last attempt to get York’s attention. After my shower, I sit on the floor, braiding my wet hair. York is on a short leash, the end of his leash tucked under my leg. Without much room to roam, he walks slow investigatory circles around me. I pretend to ignore him. He sniffs my ear, my neck, my face. No licks yet. I hold my breath. He walks around me, and I feel something grabbing my hair. York has my braid in his mouth, and he gives it one gentle tug. When he circles back around, he allows me to pet him. Still no licks, but things are improving! In the next days, York and I work in harness, traveling across nature trails, intersections, and obstacle courses. We do traffic checks, night walks, and long recalls. We work our way through obedience classes, completing routines of puppy push-ups and long-leash stays. In our room, he licks the back of my legs or lies under my desk, using my feet as a pillow. He played hard to get at first, but his love is worth working for.